Teachers and schools are dipping their toes into the world of Digital Portfolios. They are using platforms such as edublogs, Blogger, SeeSaw, Bloomz or Google Sites, to document and archive student work. 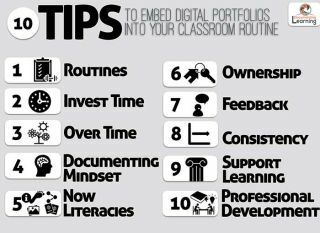 BUT….the simple act of having digital portfolios for your students doesn’t necessarily mean they are working. The learners need to own them and see benefits for documenting4learning, use them to learn and think about their own thinking. Digital Portfolios can’t be used in isolation, an add on, or as homework assignments. Disclaimer: For the sake of this blog post, I might be using the terms “Digital Portfolios”, “blogging”, and “Blogfolios” ( Digital Portfolios on a blogging platform) interchangeably. leave the portfolio work as an afterthought to be done when a project is over, when an assignment has been completed, when a unit or lesson is finished or when a parent/teacher conference is approaching. lock the portfolio behind a password, only visible to the student, teacher and potentially their parents. Resist the temptation of simply having portfolios for your students without giving them ownership and taking advantage of their pedagogical (strategies, techniques and methods for teaching) and heutagogical (self-directed and self-motivated learning) potential. 1. Routines are essential for developing habits. Use Visible Thinking Routines from Project Zero, or create your own that will help learners settle into the habit of digital portfolio work. 2. All habits, all routines need and take time to develop and take hold. Don’t expect the habit to develop overnight and on its own. Don’t give up after a few weeks or when you notice that your students are not enthusiastic and screaming for more “blogfolio work”. As with other habits you are trying to instill in your students, they might resist when they notice that blogfolios are about metacognition, new skills, and new forms of learning, which is often harder than filling out worksheets. You need to be consistent. Don’t let negative comments or protests by your students “re-affirm” some of your own insecurities on these new digital platforms. Create habits by modeling the behavior over time you want to see in your students. 4. Adopt a Documenting OF/FOR/AS Learning mindset. Create habits that make the learners DO SOMETHING with their documentation artifacts that are placed on the digital portfolio. Don’t let these artifacts become display, but dig deeper. Find ways to upgrade traditional assignments, assessments, and routines that are embedded in the digital portfolio process of documenting learning: look for learning, capture learning, reflect on learning, share learning, and amplify learning. 5. See portfolio work as a way to introduce, support and amplify the “now” literacies. Create habits that support them as digital readers, writers and digital citizens who are aware of ethical use and creation of digital content. Embed (don’t teach in isolation) mini-lessons on hyperlinked writing, amplified writing, copyright issues, curation, critical feedback, global awareness, self-assessment, visible thinking, reflection, and . 6. Give your students ownership of their digital portfolios. Don’t let the content be only required assignments. Create habits, that encourage the learner’s self-motivated contributions around topics of their own choosing, interest and passion. Ask them to become experts on a topic, curators of information about information that interests them. Reward entries by being invited to be showcased on a classroom blog as a special feature. 7. Build in regular times into your lesson plan to document, reflect, share and give each other feedback. No one wants to create and share into a vacuum. Develop the habit of mentioning student work that can be found on portfolios with your colleagues, referencing posts or artifacts during lessons, at faculty meetings, at PD opportunities, school wide assemblies, home-school communication, etc. Also share the learner’s digital portfolio beyond your local community to reach the world. Invite authentic feedback in and fuel interest in continuing to create and publish. Help students see that their work, their learning and thinking can be taken seriously by a global audience. Support them in promoting, referencing, and disseminating their work through a learning network. 8. Be and stay consistent. Consistency is the key most bloggers list as the reason for successful blog. Consistency applies to reading, writing, commenting and connecting AND enthusiasm! If you don’t show enthusiasm for your students’ portfolios and their potential, they won’t have enthusiasm for their work either. Create a publishing calendar for the rest of the school year with your students to make sure there is always fresh content on the sites. Brainstorm ways to facilitate consistency and continued enthusiasm: guest posts, participating in blogging challenges (such as My Life as a Reader, 100 Word Challenge, Quad-blogging), document current events, their significance and connections to a bigger picture. 9. Don’t forget that it’s not about creating beautiful digital portfolio entries, but about supporting learning! Create a process that look at all contributions to the portfolio ad their connections (or potential connections) to learning! 10. Understand the potential of digital portfolios for your own professional learning. Create a habit of regularly think about your thinking, reflect on your teaching and learning, capture your own learning, make it visible and share with a wider audience. Become aware of your own development of regularly creating and sharing a professional portfolio.